Sometimes, distributed rendering problems which are very hard to diagnose, such as missing textures and other assets, may be caused by DrServer running with elevated UAC rights (running as administrator). By default, if UAC is enabled, Windows do not show network-mapped drives to applications running as administrator. As a result, 3ds Max, which will also get started with elevated rights, cannot access assets which are stored on network-mapped drivers unless UNC paths are configured. Starting from Corona 1.4, there is no need to run DrServer as administrator. If for some reason it is ran as administrator, DrServer will show a warning. In such case, the solution is to launch the application without the elevation. 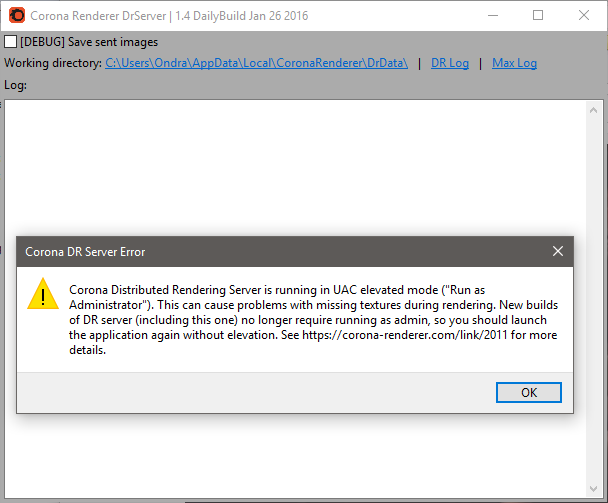 Note: to get rid of the problem, it is advised to update Corona Renderer to the newest version. This should fix the problem permanently (restart may be required). After that, you should be able to go to properties of DrServer.exe and uncheck the "run this program as admin" option - if it's greyed out, you will need to go to "change settings for all users" and uncheck it in there.